THIS is Ireland and Celtic striker Anthony Stokes pictured at a memorial party for a murdered Real IRA boss. The 24-year-old player was snapped at the Dublin benefit in honour of Alan “The Model” Ryan, who was killed in a street execution in September. The pair are said to have known each other for years through Ryan’s association with the Players Lounge Bar in Fairview, Dublin. The bar is owned by Stokes’s dad, John, who was also at the party. The photograph – which was first published in an Irish newspaper – shows Stokes posing with his arm draped around a woman in a gold dress. A source quoted by the Irish paper said: “Anthony seemed very much at home. He was in great form, fairly relaxed and was clearly enjoying himself and enjoying being home. Stokes’s brother Michael, 27, is a former guitarist in republican band The Players Brigade. He did not attend the party but his former band played and sold a tribute CD featuring a song called The Ballad of Alan Ryan at the event. Elsewhere at the party, revellers were invited to buy raffle tickets but a source said it was unclear what money was being raised for. Police in Dublin said leading republican dissidents from both sides of the border were there, including a number suspected of involvement in the murder of Northern Ireland prison officer David Black. 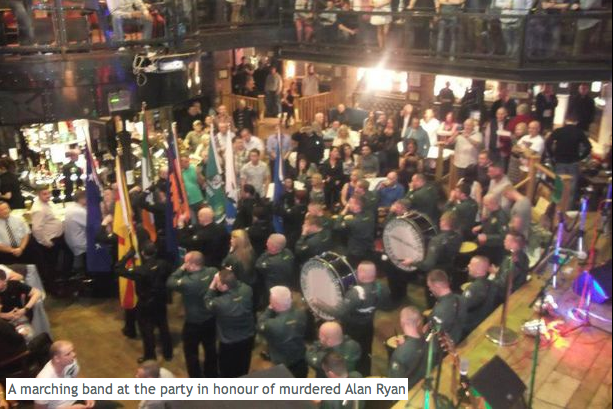 Ryan, 32, was the leader of the Dublin brigade of the Real IRA – one of the breakaway groups opposed to Northern Ireland’s peace process. He is believed to have been responsible for two murders in the last two years. He has strong links to John Stokes, 54, whose bar has been at the centre of violence and controversy in the past. Three men, including a doorman, were gunned down outside the bar in July 2010. Stokes snr was ordered to remove a 40ft banner barring the Queen from his pub during her visit to Ireland last year. He said he reluctantly agreed after police threatened to object to his application for late licences. In August last year, the pub was gutted in a fire allegedly started by robbers. 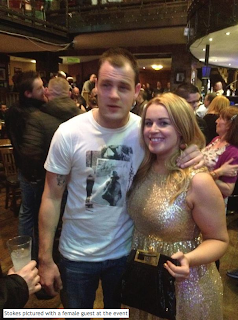 Gangland enforcer Ryan was gunned down outside his home in Dublin in September. His killer fired six shots from a Glock handgun, hitting Ryan in the chest. As Ryan struggled to get to his feet, the gunman calmly stood over him and blasted him twice in the head. Men and women in paramilitary-style uniforms marched behind the hearse and shots were reportedly fired. The events were condemned as “reprehensible and absolutely unacceptable” by Irish justice minister Alan Shatter. Stokes began his senior career with Arsenal but first played in Scotland with Falkirk in 2006. After moving to England and flopping at Sunderland, he came back to Scotland when Hibs signed him in August 2009. He moved to boyhood heroes Celtic shortly after the start of the following season, for a fee of around £1.2 million. Stokes has been out of action with an ankle injury since July. Stokes and his agent declined to comment on his attendance at the party last night.